Be the change you create to be! 50 bright COSAT students, 50 beautiful visions of what matters to them, lots of paint, scissors, magazines,..
Heat! (oeh what a cold day and room), Anasuya and Fre for the explanations and fun, photo camera’s, …and whatever the students brought with them (from sand, to beats, to leaves, to fabric) and lots of plastic bags to keep the mess out of this examination hall. After the session we put all the Tiles together and asked the students which two tiles would represent them (=all students) best. That was such a fun exercise. It really made them feel as “being one”. Everybody was very energetic when they finally agreed on the two. 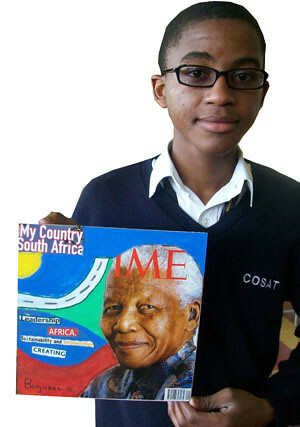 After their decision we announced that those chosen two tiles will be presented at the school assembly next week. Exciting. Next is to create a mural with the tiles, preferable somewhere in the community, to spread their inspiring messages not only here, online, but also directly to the people the students care about. Please keep on posting your comments to the students here on the site. They check in here quite often and really appreciate your words! Peace Tiles are 8″ x 8″ collages and mixed media assemblages created on 1/2-inch thick wood panel. They are invented by our amazing friend Lars, founder of The Peace Tiles project : a great initiative that stimulates and supports community-based workshops, exchanges between individuals and communities, and the installation of Peace Tile murals in locations around the world. Peace Tiles are a great way to stimulate self-expression and creativity, deepen awareness and understanding of global issues, make new connections in the world and strengthen existing ones, and promote community service. 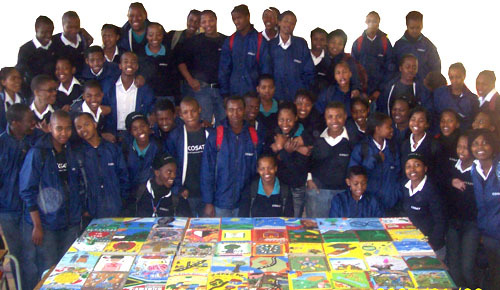 Peter and I organized the first Love to the World Peace tiles workshop in the NW province of South Africa at a very rural and underprivileged school (5 grades in 1 classroom, ages from 6 to 14). 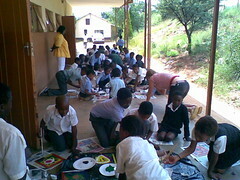 Lots of those children had never worked with paint, others maybe once every 2 years. 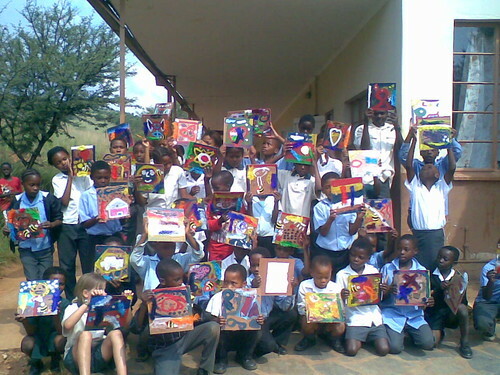 It was such a gift for them (and us) that an American and a Dutchie found their way to their little school with this box full of art supplies. And even more that they would all become part of this global Peace Tiles initiative. The theme of our workshop was happiness. “What makes you happy? Or has made you happy? What do you dream about?” (things like: my mum, new clothes, my birthday, Christmas, this workshop). Even-though these children could hardly understand any English, thanks to the great teacher who translated to Setswana and our drama-skills, the workshop was a great success. First we tried to discover in little discussion groups what activities in the past, at this moment or in dreams made them happy. With the entire group (40 children) we wrote down what things in general a person needs to live a happy life, to experience happiness. This session provided enough inspiration to write down/sketch their own story of happiness. 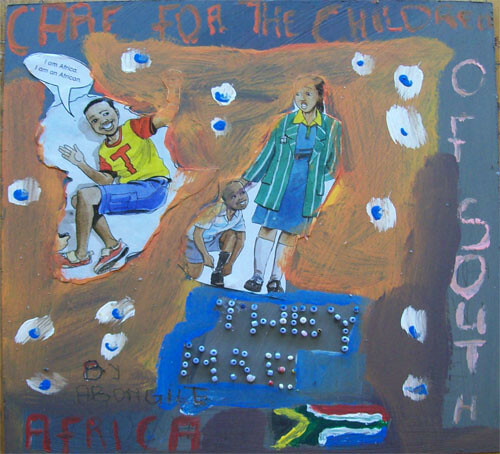 After an explanation of the tile as the art-object and the possibilities of paint/paper/glue the children were ready to create their own story on the tile. 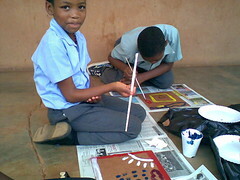 With lots of concentration in their eyes, big smiles on their faces and paint everywhere they’ve created some amazing art works. See the results over here! We want to say a big thank you to Mrs Deitz (Peters’ mum) from New York for sponsoring the supplies! Our first Peace Tilesworkshop was a great success. The teacher explained to me afterwards how valuable this was for the children. Not only for them to be able to work with arts, but also to think about things they would otherwise never discuss and are very important. The happiness theme gave lots of the children a feeling of appreciation: although they do not have much, they can be happy and appreciate the beautiful things, feelings, moments. The happiness theme also stimulated the children to think about their future and created hope: to have dreams and to make dreams come true. 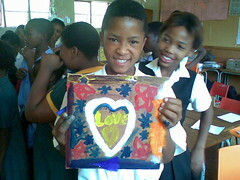 We love the Peace Tiles workshop! ..and we’ll do lots more of them! Interested to know more about the Peace Tiles project? Check out the beautiful Peace Tiles website! Lars (Peace Tiles founder) wrote a news item about our workshop, which you can find here. Don’t forget to take a look at our photo gallery! Lots of creative greetings to you!